1700s ~ 1710s: disciple of Nakamura Shichisaburô I, his first stage name is Nakamura Goroshirô II. He serves his apprenticeship in tabi shibai and miyaji shibai. 11th lunar month of 1716: he becomes disciple of Tomizawa Hanzaburô I, becomes tachiyaku and takes the name of Narumi Goroshirô I at the Nakamuraza, performing in the kaomise drama "Mitsudomoe Katoku Biraki", which celebrates the shûmei of Arashi Kiyosaburô II. 11th lunar month of 1718: Goroshirô becomes katakiyaku and plays at the Nakamuraza in the kaomise program "Hirakana Yomeiri Izu Nikki", which welcomes in Edo the Kamigata actor Sanogawa Mangiku. 11th lunar month of 1720: Goroshirô plays at the Moritaza the role of Usui no Aratarô in the kaomise drama "Kaigô Sakiwake Shitennô". 1st lunar month of 1721: Goroshirô plays in the same theater the role of Kobayashi no Asahina in the new year sogamono "Nigiwai Suehiro Soga"; his stage partners in the role of Soga Gorô Tokimune, Soga Jûrô Sukenari and Kudô Saemon Suketsune are Ichikawa Danjûrô II, Mimasuya Sukejûrô I and Ogawa Zengorô I. The performance is a tremendous success. 11th lunar month of 1722: Goroshirô becomes jitsuaku. 1st lunar month of 1723: Goroshirô's rank in the Edo hyôbanki, jitsuaku section, is two black strokes above jô-jô-(shiro)kichi (superior - superior - (white) excellent) [visual]. 11th lunar month of 1723: Goroshirô plays at the Nakamuraza in the kaomise program "Sono Enpô Onna Migyôsho", which celebrates the arrival at the Nakamuraza of the Kamigata actors Yamashita Kinsaku I and Sanogawa Senzô. 1st lunar month of 1727: Goroshirô's rank in the Edo hyôbanki, jitsuaku section, falls to jô-jô-(shiro)hankichi (superior - superior - (white) half excellent). 11th lunar month of 1727: Goroshirô becomes katakiyaku. 1st lunar month of 1728: Goroshirô's rank in the Edo hyôbanki, katakiyaku section, is jô-jô-(hanshiro)kichi (superior - superior - almost excellent). 11th lunar month of 1729: Goroshirô becomes jitsuaku and plays at the Nakamuraza the role of Arajishi Otokonosuke in the kaomise drama "Ume Goyomi Konrei Nagoya". 1st lunar month of 1730: Goroshirô's rank in the Edo hyôbanki, jitsuaku section, falls to jô-jô-(shiro)hankichi (superior - superior - (white) half excellent). 11th lunar month of 1730: Goroshirô becomes tachiyaku and plays at the Moritaza the role of Gongorô Kagemasa (the superhero in the "Shibaraku" scene) in the kaomise drama "Kankatsu Michinoku no Miyako". 1st lunar month of 1731: Goroshirô's rank in the Edo hyôbanki, tachiyaku section, is jô-jô-(shiro)hankichi (superior - superior - (white) half excellent). 11th lunar month of 1732: Goroshirô becomes jitsuaku and plays at the Nakamuraza in the kaomise drama "Yamato Kotoba Imagawajô", which welcomes in Edo the Kamigata actors Anegawa Shinshirô I, Sakakiyama Koshirô I and Arashi Otohachi I (who celebrates his shûmei). 1st lunar month of 1733: Goroshirô's rank in the Edo hyôbanki, jitsuaku section, is jô-jô-hankichi (superior - superior - half excellent). 11th lunar month of 1733: Goroshirô plays at the Nakamuraza in the kaomise drama "Nagi no Hana Asahi Genji"; his stage partners are Sawamura Sôjûrô I, Anegawa Shinshirô I, Segawa Kikunojô I, Ogino Izaburô I, Hayakawa Denshirô, Nakamura Shichisaburô II, Sodesaki Iseno I, Ichikawa Sôzaburô I, Nakamura Kichibê I, Sakata Sadashirô, Yamashita Kamematsu I, Sanjô Kantarô II and Ôtani Ryûzaemon I. 1st lunar month of 1734: Goroshirô's rank in the Edo hyôbanki, jitsuaku section, falls to jô-jô-(shiro)hankichi (superior - superior - (white) half excellent). 11th lunar month of 1735: Goroshirô plays at the Nakamuraza in the kaomise drama "Tono Zukuri Shinoda Zuma". 1st lunar month of 1736: Goroshirô's rank in the Edo hyôbanki, jitsuaku section, is jô-jô-hankichi (superior - superior - half excellent). 11th lunar month of 1736: Goroshirô becomes tachiyaku and plays at the Nakamuraza in the kaomise drama "Kuni no Tomi Sesshôseki"; his stage partners are Ôtani Hiroji I, Segawa Kikunojô I, Segawa Kikujirô I, Nakajima Mihoemon I, Arashi Otohachi I, Nakamura Kichibê I, Hayakawa Denshirô, Ogino Izaburô I and Kameya Jûjirô (who arrives from Kamigata). 1st lunar month of 1737: Goroshirô's rank in the Edo hyôbanki, tachiyaku section, is jô-jô-hankichi (superior - superior - half excellent). 11th lunar month of 1737: Goroshirô becomes jitsuaku and plays at the Nakamuraza the role of Matano no Gorô in the kaomise drama "Soga Monogatari Osana Nikki", which celebrates the arrival in Edo of the Kamigata actors Yamamoto Kyôzô, Yamamoto Hikogorô and Kaneko Mantoku. 1st lunar month of 1738: Goroshirô's rank in the Edo hyôbanki, jitsuaku section, is jô-jô-hankichi (superior - superior - half excellent). 3rd lunar month of 1740: Goroshirô's rank in the Edo hyôbanki, katakiyaku section, is jô-jô-hankichi (superior - superior - half excellent). 11th lunar month of 1741: Goroshirô becomes jitsuaku and plays at the Nakamuraza in Hayakawa Denshirô's kaomise drama "En'ya Hangan Kokyô no Nishiki", which welcomes in Edo the actors Sanogawa Mangiku, Nakamura Shingorô I, Nakayama Shinkurô I and Nakamura Tomijûrô I. 1st lunar month of 1742: Goroshirô's rank in the Edo hyôbanki, jitsuaku section, is jô-jô-hankichi (superior - superior - half excellent). 11th lunar month of 1746: Goroshirô plays at the Moritaza the role of Hachiman Tarô in the kaomise drama "Ôtorii Gojûshigun". 1st lunar month of 1747: Goroshirô's rank in the Edo hyôbanki, katakiyaku section, is jô-jô (superior - superior). 11th lunar month of 1748: Goroshirô plays at the Nakamuraza the role of Dainichibô in the kaomise drama "Onna Moji Heike Monogatari", which welcomes in Edo the Kamigata actor Nakamura Kumetarô I. 1st lunar month of 1749: Goroshirô's rank in the Edo hyôbanki, jitsuaku section, is jô-jô-(shiro)kichi (superior - superior - (white) excellent). He shares the same rank with Sakata Tôjûrô III and Nakajima Mihoemon I. 11th lunar month of 1749: Goroshirô becomes katakiyaku and plays at the Nakamuraza the role of Suda Jirozaemon in the kaomise program "Onnô Taiheiki", which celebrates the shûmei of Sakata Hangorô II and Ichikawa Yaozô I. 1st lunar month of 1750: Goroshirô's rank in the Edo hyôbanki, katakiyaku section, is jô-jô-(shiro)kichi (superior - superior - (white) excellent). 11th lunar month of 1750: Goroshirô plays at the Nakamuraza the role of Nagata no Shôji in Tsuuchi Jihê II's kaomise drama "Wakaki no Ume Taira no Kiyomori". 1st lunar month of 1751: Goroshirô's rank in the Edo hyôbanki, katakiyaku section, is jô-jô-(hanshiro)kichi (superior - superior - almost excellent). 7th lunar month of 1751: first Kabuki adaptation of the puppet theater drama "Koi Nyôbô Somewake Tazuna", which is staged at the Nakamuraza; Goroshirô plays the roles of Edohei and Hachizô [casting]. 11th lunar month of 1751: Goroshirô plays at the Nakamuraza the role of Akaboshi no Shôji Saemon in the kaomise drama "Honryô Hachinoki-zome", which welcomes in Edo the Kamigata actors Fujikawa Heikurô and Sanogawa Hanazuma II. 1st lunar month of 1752: Goroshirô's rank in the Edo hyôbanki, katakiyaku section, falls to jô-jô-(shiro)kichi (superior - superior - (white) excellent). He shares the same rank with Nakajima Kanzaemon II. 11th lunar month of 1753: Goroshirô plays at the Nakamuraza the role of Oyamada no Shôji in the kaomise drama "Hyakumanki Tsuwamono Taiheiki", which celebrates the shûmei of Ichikawa Masuzô I. 11th lunar month of 1754: Goroshirô plays at the Nakamuraza the roles of Itô Nyûdô and Kajiwara Heizô Kagetoki in the kaomise drama "Miura no Ôsuke Bumon no Kotobuki", which celebrates the shûmei of Ichikawa Danjûrô IV, Matsumoto Kôshirô III and Tsuuchi Monzaburô II. 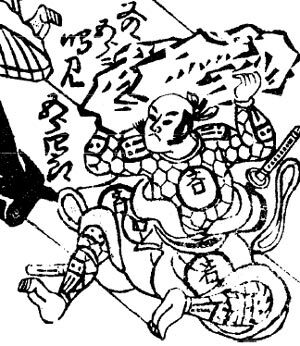 1st lunar month of 1755: Goroshirô's rank in the Edo hyôbanki, katakiyaku section, is back to jô-jô-(hanshiro)kichi (superior - superior - almost excellent). Goroshirô plays in the same theater the role of Ameji Kengyô in the new year sogamono "Waka Midori Nishiki Soga". 1st lunar month of 1757: Goroshirô plays at the Nakamuraza the role of Ômi no Kotôta in the new year sogamono "Nippon Zutsumi Tori no Ne Soga". This is most likely his last stage appearance. 18th day of the 11th lunar month of 1758: Goroshirô dies in Edo. Narumi Goroshirô I was a 18th century talented and popular actor, who was able to perform a wide range of male roles, often switching to different roles categories during his long career (more than 50 years on the Edo stages), like katakiyaku, jitsuaku or tachiyaku. He was also the tôdori of the Nakamuraza during the second half of the 1750s.